Glioblastoma multiforme (GBM) is the most deadly form of brain cancer. “It is usually fatal, on average, in about 18 months from the time the patient is diagnosed—and that’s with therapy,” says neuroradiologist A. Gregory Sorensen, MD, codirector of the A. A. Martinos Center for Biomedical Imaging in Boston. “Without therapy, it’s even less.” However, recent advances in brain imaging and treatment are providing new hope to those stricken with GBM. In May, the FDA approved the use of the drug Avastin (bevacizumab) for recurrent glioblastoma. Avastin isn’t a new cancer drug. It has been approved for treatment of colorectal cancer; advanced nonsquamous, non–small-cell lung cancer in combination with chemotherapy; and with chemotherapy to treat certain cases of advanced breast cancer. The drug’s approval to treat glioblastoma is the first new treatment for this lethal form of brain cancer in more than a decade. Avastin works by inhibiting a protein called vascular endothelial growth factor (VEGF) and, in doing so, curbs the growth of new blood vessels that supply blood to tumors. “Imaging played a big role in the drug’s approval for GBM because the drug caused dramatic changes in the images of the brain,” Sorensen says. Before approving the drug, the FDA questioned whether the dramatic changes seen on MRI scans after treatment were real improvement: Did the drug really cause the tumor to shrink or was it what has been called a “steroid effect,” where steroids can cause a tumor to shrink temporarily? “The FDA was convinced by the advice that it received at the advisory board meeting that, in fact, this drug helped people,” says Sorensen, who testified at the meeting. Sorensen sees dynamic MRI studies helping to find the best treatment for each glioblastoma patient. “Shifting from conventional MRI to this new ‘mechanistic’ MRI could allow us to begin to untangle how these diseases work and therefore how to design therapies to interrupt or interfere with the disease,” he says. “We also can use MRI techniques to monitor whether the therapies are working.” Avastin can cost as much as $20,000 per month and comes with risks of significant side effects, which include developing gastrointestinal perforations, complications with wound healing, and severe or fatal bleeding. “Before we tell patients we’re going to risk these side effects and charge your insurance company $20,000 a month, you might want to know, ‘Am I going to benefit? Is it worth the risk?’ If we can answer that with an MRI scan early in the course of treatment, why wouldn’t we? The cost of the scan is small in comparison to the cost of the drugs and the risks to the patient,” Sorensen says. Dynamic imaging can be done with most MRI scanners. “It requires some additional know-how and some sequences that are on most MRI scanners,” Sorensen says. The difference is in the way the computer processes the images, but the experience of having the scan is no different. While Sorensen and his colleagues have been using dynamic MRI looking at perfusion imaging, Whitney Pope, MD, PhD, and his colleagues at UCLA have been using diffusion-weighted imaging (DWI) (the measure of water motion within the brain tumor) to determine the potential effectiveness of Avastin. “We can take a patient that has recurrent GBM, we measure the diffusion in that tumor and can predict with 70% accuracy whether they will progress or not within six months if they are treated with Avastin,” he says. Using diffusion MRI, the researchers calculated the apparent diffusion coefficient (ADC) of the tumors and predicted that tumors with higher ADC values are more likely to respond to treatment. Pope notes that 70% is not 100%. “We’re working on ways to improve that accuracy, but hopefully what will happen is we will be able to select patients and say, ‘You’ll respond to this drug, and you’ll respond to that drug,’ so we can tailor therapy to the brain tumor that the patient has and then after a month check them to see if they are responding as we predicted they should.” Their paper, “Recurrent Glioblastoma Multiforme: ADC Histogram Analysis Predicts Response to Bevacizumab Treatment,” was published in Radiology in July. 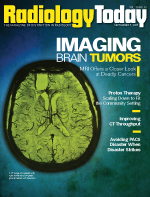 At the University of California, San Francisco, researchers have begun using its 7T scanners to quantify brain tumors and try to distinguish between treatment effect, which can mimic tumors, or recurrent brain cancer, says Igor Barani, MD, an assistant professor in the department of radiation oncology. “We are developing protocols to improve the image acquisition and come up with new imaging sequences that will allow us to visualize normal brain, as well as diseased brain, at much higher resolution and quality. We have some preliminary scans where we can see abnormal pathology with high-field strength magnets but see essentially nothing but normal brain on a conventional scan. Using spectroscopy, we are able to identify nonenhancing tumors,” he says. Current protocols for treating brain tumors are based on anatomic imaging and thus mainly enhancing tumor, Barani says. With MRI spectroscopy, which is possible with higher field strength magnets, “we can find nonenhancing tumors that we couldn’t before and possibly change the treatment volume. If we find it early, we can treat the tumor that may progress to this more aggressive, enhancing disease and do that in a much more accurate way,” he says. Still another promising area for brain imaging is MR/PET. “MR/PET is not in commercial production yet, but it will be in a couple of years,” says Pope. Being able to combine anatomical and functional imaging will also help oncologists identify brain tumors earlier and plan more accurate treatments. The development of MR/PET will also require new radioactive tracers for brain imaging, Pope says. “The problem with FDG for the brain is that FDG is based on glucose and the brain is metabolically active, particularly in the cortex, so there is a high background signal in the brain,” he says. Researchers at UCLA have been investigating two new tracers: F-fluorothymidine (F-FLT) and F-fluoro-L-phenylalanine (F-FDOPA), a dopamine precursor. F-FDOPA has been used to assess the integrity of dopaminergic system movement disorders such as Parkinson’s disease but only recently has shown promise in brain tumor imaging, Pope says. The researchers published a study in the European Journal of Radiology in 2008 in which they found that F-FDOPA had a higher sensitivity for gliomas than traditional FDG-PET imaging. For the F-FDOPA to enter the brain tumor, it must cross the blood-brain barrier. “You need a certain degree of vascular disruption for the contrast to flow out of the blood vessels and into the tumor,” Pope says. “But the F-FDOPA is taken up by active transport mechanisms, so you don’t need the breakdown of the blood-brain barrier. That’s why it could add significant value to standard MRI contrast.” Researchers from UCLA also published a paper comparing F-FLT and FDG PET in The Journal of Nuclear Medicine in 2005.